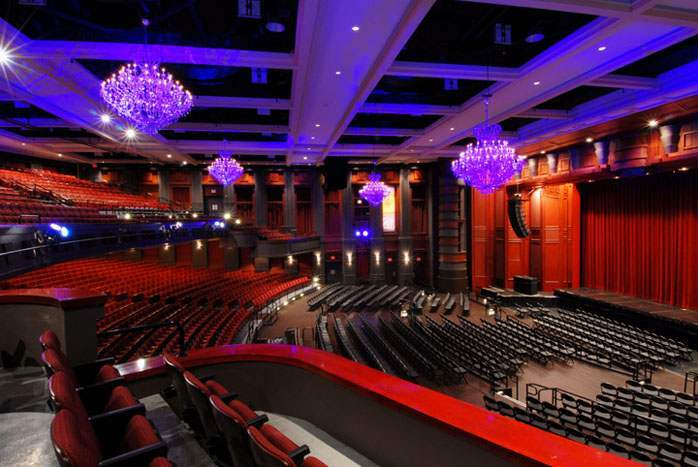 Today's "dark" theater is The Fillmore Miami Beach. Originally built as the Miami Beach Auditorium, it was home to The Jackie Gleason Show, which taped in front of a live studio audience there from 1966 to 1970. Morris Lapidus renovated and relaunched it later in the 1970s as The Miami Beach Theater of the Performing Arts, and it was a regular stop for national tours of Broadway shows. 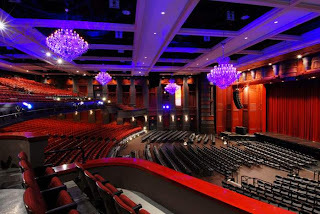 The space was re-christened The Jackie Gleason Theater of Performing Arts in 1987, and the tours continued to stop there until the Adrienne Arsht Center opened. Now run by LiveNation, it's mostly home to concerts. But on April 17, Mad Cat Theatre Company will perform Charming Acts of Misery in a space identified as "Backstage @ the Fillmore" as part of this year's South Beach Comedy Festival. How sweet it is! And now for your Monday reading list. An actress as well as a business manager, Barnett was a founding company member of Florida Stage when it began in 1987 as a college-based troupe. Well, no. Theatre Club of the Palm Beaches did PERFORM at a college. It premiered in 1987 with On the Verge at Palm Beach Community College's "Little Duncan" theater with a cast that featured Barnett, Lourelene Snedeker, Mellisa Hart, and Edgar Allan Poe IV (no, really!). None of these people were college students at the time. And we're pretty sure they weren't on staff at the college either. The Drama Queen described it a little better. Nan Barnett, the theater professional whose business savvy helped grow Florida Stage from a college-based professional company to the country's largest regional theater devoted to new plays, has just been named the new executive director of the National New Play Network (NNPN). That's a little better; and perhaps we're nitpicking, but in fact the company was based in Louis Tyrell's kitchen, at least at first. The Learning Stage started off producing original plays (primarily for children) at The Norton Gallery Auditorium in 1985. By the time Theater Club started its second season, it had take over the entire house. Learning Stage was absorbed into the company entirely around the time Theatre Club of the Palm Beaches gave way to The Lois Pope Theater, the interim name of the company that became Florida Stage. By the time the theater moved out of his house, he'd already moved out to larger diggs around the corner, where he and his wife hosted legendary Halloween Parties. We've known Nancy Barnett for a long time, and as always, we're proud of her success. Although frankly, we miss her performances on stage. She was the best Rita in Educating Rita. Broadway World reports that Blue Man Group will be among next season's offerings at The Adrienne Arsht Center for the Performing Arts. "In order to create a touring version of our theatrical production, we knew we had a creative challenge to tackle," says Blue Man Group co-founder Philip Stanton. "We needed to find a way to transform theatres of all shapes and sizes into spaces in which the Blue Man can intimately connect with the audience, where the audience can become engaged with the spirit of the show and the Blue Man himself. We think we have finally figured it out, and hopefully we will accomplish our goal, which is always to help audience members reconnect with their own sense of wonder and discovery, with their own sense of what is possible in their lives." The Arsht line-up also includes We Will Rock You, Elf, Once, Warhorse, and Evita. These are original stories, American dream stories, “I have a barn” stories, against all odds, “let’s start a theater” stories. Why should any brave soul be denied this freedom? If nothing else, what is remarkable is that these contemplations and queries document a wonderful tradition of discourse that stands as a vibrant reflection of the resilience of the African American artist in the American theater. Lots of references cited in this one; it's the kind of article that can lead you into a whole new field of inquiry. Good stuff. Florida Theater On Stage reports that Actors' Playhouse has announced four of its six schedule productions for 2013-2014 season; Ruthless The Musical, Making God Laugh, End of the Rainbow, and the regional theater premiere of Monty Python's Spamalot. The Palm Beach Daily News reports that Jack W. Jones is retiring as the organist and director of music for the Royal Poinciana Chapel. Founding The Masterworks Chorus of the Palm Beaches in 1979, Jones served as its director until 2010, when he retired. He is now director emeritus. He was the artistic director/pianist of the Florida Repertory Theater from 1984 to 1991, and also served as the pianist for some of the productions and training classes at the Burt Reynolds Theater in the 1980s and ‘90s. He has worked as artistic director/pianist and/or conductor for various theater and performing groups throughout the area. Even though Jones is retiring from the chapel, he’s not retiring from the music profession. He said he would like to substitute as an organist for a church or churches in the Franklin area. He also would like to get involved with some musical theater groups and choirs performing Christmas programs. Florida Theater On Stage tells us about some new additions to its calendar; you've already missed Karen Stephens as Zora Neale Hurston at Actors' Rep, but you can still catch Weisenthal: The Conscience of the Holocaust starting Wednesday at the Aventura Arts and Cultural Center, the Palm Beach Dramaworks fundraiser on March 22, and Blue Man Group next year at the Arsht. National Public Radio discusses the off-Broadway revival of The Last Five Years its composer and lyricist, Jason Robert Brown. It premiered off-Broadway in 2002. This is actually a podcast, but there is a summary of the interview. You may recall that Actors' Playhouse stage the regional premiere production of the 2 person musical. It garnered 3 Carbonell Award nominations; Best Actor for Christopher Kent; Best Actress for Janet Dacal, and Best Musical Direction for Emmanuel Shvartzmann. So who takes home the golden egg? Come out on April 1 and find out!